Line D is a survey section heading due west from Islay off the west coast of Scotland. 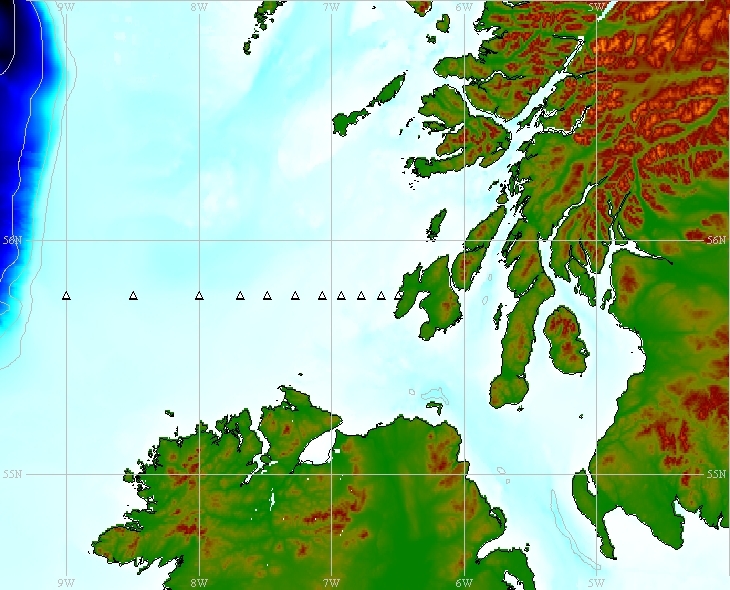 The line comprises 11 fixed STD/CTD stations, which were established as part of routine monitoring work on the Scottish continental shelf by Dunstaffnage Marine Laboratory (DML). The line was occupied between the mid 1970s and mid 1990s. The white triangles indicate the nominal positions of each standard station on DML Line D.
* Stations 98D and 99D were incorporated into Line D for occupations carried out in 1991 and 1992. In addition to Line B, there are other DML repeated survey transects which converge at Islay. These are Line B,Line C, andLine P.
Station 5D is one of 11 fixed STD/CTD stations west of Islay (Scotland), established by scientists at Dunstaffnage Marine Laboratory (DML).